I came across this video link from Las Vegas illusionist and entertainer Penn Jillette (of "Penn & Teller" fame). Apparently, after a performance, one of the "volunteers from the audience" from the from previous nights' show came up to him, complimented him for a great performance, and then gave him a copy of the New Testament. Penn is an outspoken atheist, yet for some reason was visibly moved by the sincerity of this gesture. 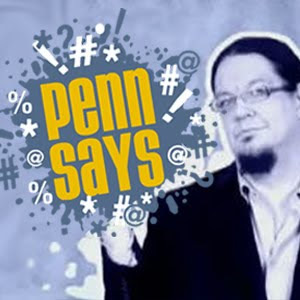 Penn's comments on his video blog can be found here: http://www.youtube.com/watch?v=7JHS8adO3hM. I found it very worth watching. Here's a few comments from the actual blog. As I said, I found his comments (about five minutes) worth watching.